The first maps summarizing current small grain crop stages, disease and insect incidence have been posted. 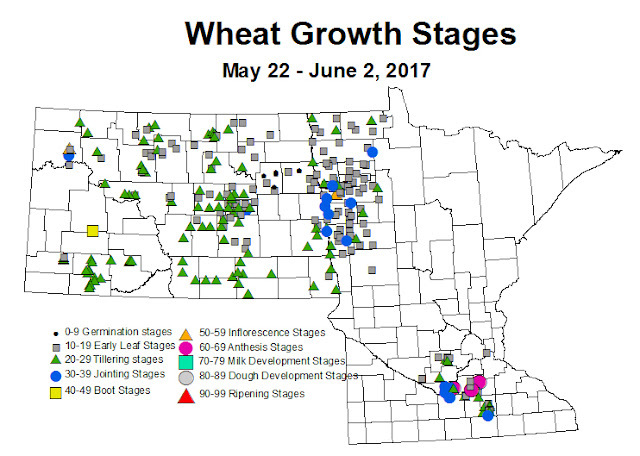 The southern areas of Minnesota represent winter wheat, which is much further developed than the NW HRSW, oats, and the occasional rye. West central and northwest will consist mainly of HRSW and Barley (similar for North Dakota). 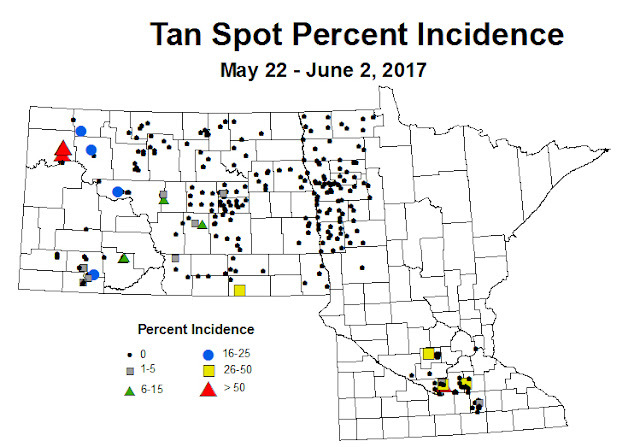 Current small grain diseases detected by survey scouts include Tan Spot, though Powdery Mildew, Stripe Rust in variety test plots, and Barley Yellow Dwarf have also been mentioned by others in the southern locations (see SW MN IPM STUFF 2017 Issue 4). what to spray, when not to spray! Cereal Aphids have been reported from winter wheat in southern locations for several weeks. Surveys from last week in the central MN small grain fields detected some fields with aphid infestation levels as high as 50% of stems with at least one aphid present. 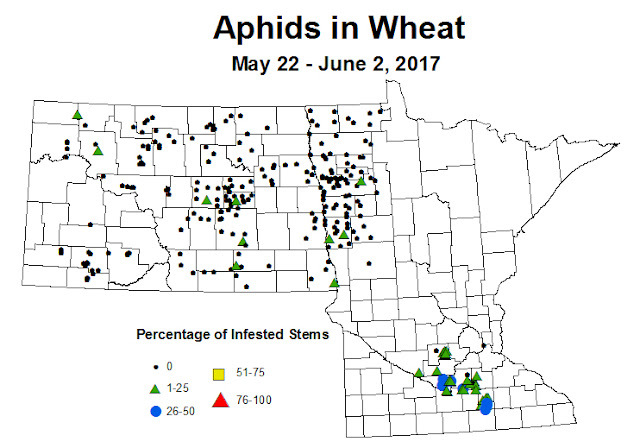 The treatment threshold for cereal aphids in small grains is 85% of the stems with at least one aphid present. This treatment threshold corresponds to a population estimate of cereal aphids averaging 12 aphids/stem. The northern HRSW fields surveyed has had very few fields where aphids have been detected yet. The few fields where they were found are at very low incidence.